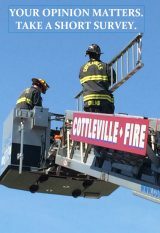 The Cottleville Fire Protection District would like to remind everyone to change their smoke detector batteries when they change their clocks on Saturday evening, November 3th, 2018. In addition, we would like to provide a few maintenance and safety tips regarding smoke detectors. If the smoke detector is more than ten (10) years old, it will need to be replaced. Hard-wired smoke detectors in newer homes do have batteries, be sure that you replace them with new batteries. Some older homes, ten to twenty years old, have hard-wired smoke detectors without battery backups. These smoke detectors need to be replaced with hardwired smoke detectors with battery backups. Keep in mind those smoke detectors without battery backups will not work if your electricity is out. When placing a smoke detector in your home, ensure that you install it at least 18 inches from void spaces i.e. that area where the ceiling and wall meet. Install smoke detectors away from vents. Now would also be a good time to review your emergency escape plan and/or if you do not have one a good time to make one. Remember to sleep with your door shut as this simple step can give you an extra 15 to 25 minutes to escape a fire safely. In addition to smoke detectors, CO alarms should be checked. A CO alarm (7) years old or older should be replaced. When installing a CO alarm, ensure that it is away from vents, in an area where you will hear it when you are sleeping, and not installed near gas-fired appliances.